History teacher, Peter Rudge, gives his account of the Fourth Form History Department trip to China. There are several things I won’t miss about the History Department’s trip to China: Air China’s self-check-in service, sweet and sour chicken and Beijing’s air pollution (or sea mist depending on who you believe!). Aside from these minor gripes, it is fair to say that the trip was both hugely enjoyable and endlessly fascinating. Within a couple of hours of landing we were being cycled around a Beijing Huton in rickshaws, and all thoughts of jet lag were forgotten as we took in the sights and smells of one of the oldest quarters in Beijing. Each day had huge moments visiting sites that gripped the imagination. Mao’s mausoleum was one of our first visits and a great way to introduce such a significant figure within the IGCSE History syllabus, who still remains such a hugely visible figure within China. Seeing the thousands of Chinese visiting to pay their respects to Mao left us in no doubt about the importance and respect he is still granted. Following that with a short talk from our tour guide about the events of 1989 in Tiananmen Square, and a comparison with how those events are seen in the West, was an important opportunity for our young historians to think about the issues of interpretation and historical debate. Stepping further back into China’s history, we then went on to visit the breath-taking Forbidden City, one of five UNESCO world heritage sites we visited during the trip before finishing the day with a Kung Fu show at a local theatre. The next day took us to Beijing’s military museum where displays of Chinese military technology were contrasted with the shattered remains of captured Japanese or American hardware. 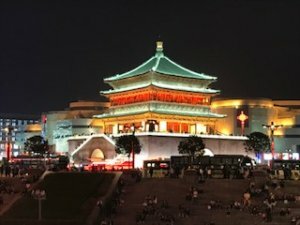 The more traditional feel of our next stop, Xi’an, after the developed and congested Beijing was a pleasant contrast and our first day there took us to the tranquil Wild Goose Pagoda before we visited one of the highlights of the trip, the Terracotta Warriors, just outside Xi’an. After the monumental display of manpower and resources that the tomb of the Qin represents we then returned to Xi’an to visit the beautiful tranquility of the Mosque, which sits just a few feet away from the noise and aromas of the exciting Muslim Quarter markets. 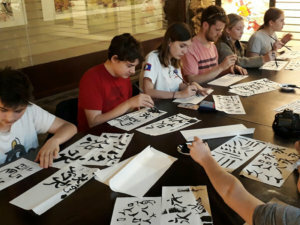 Our final day in Xi’an gave us the opportunity to stretch our legs with a cycle ride around the ancient city walls, before grappling with the complexities of Chinese writing with a lesson in calligraphy. The bullet train whisked us back to Beijing that evening ready for our trip to the Great Wall. After the cycle in Xi’an the previous day, climbing the Great Wall was an opportunity to turn our muscles to complete jelly with huge, near-vertical rises, which made clear what an awesome logistical challenge and feat of manpower the construction of the Great Wall was. After that it was a relief to relax again by visiting the quiet of the Lama Temple in Beijing. It was a trip full of both history and culture and the pupils embraced the opportunity enthusiastically. It was great to learn how the Chinese people felt about modern China and also how they thought about their past. It will be invaluable in the pupils’ study of 20th century China, and I’m sure it will be a trip that will live long in the memory.